One picture tells a thousand words and these remarkable pictures of an egg slowly emerging from its follicle show us one of those magic events, in particular one that IVF patients and women trying to conceive are focused on. 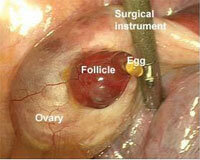 Observing ovulation in humans is extremely rare, and previous images have been fuzzy. Donnez captured the event by accident while preparing to carry out a partial hysterectomy on a 45-year-old woman. The release of an egg was considered a sudden, explosive event, but his pictures, to be published in Fertility and Sterility, show it taking place over a period of at least 15 minutes. Shortly before the egg is released, enzymes break down the tissue in the mature follicle, a fluid-filled sac on the surface of the ovary that contains the egg. This prompts the formation of a reddish protrusion, and after a while a hole appears, from which the egg emerges, surrounded by support cells. It then enters a Fallopian tube, which carries it to the uterus.